Of Horses and Men: And They're Off! Those are the words that I can't wait to hear. I am so looking forward tp my week vacation from work so that I can go to the local fair and amarshal the STB races. Now I know a lot of people will look at me funy and ask why I'm doing that on my vacation and what the fun really is in it, but I had such a blast last year. Basically a Marshal leads the horses in the post parade and makes sure that everyone is set and no equipment is hanging or anything. 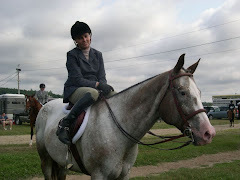 The marshal also can help a driver is they can't get their horse to turn in practice or in getting to the starting gate. 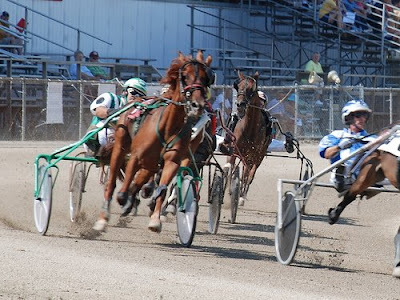 The starting gate in STB racing is usually a car with big long wings that starts out slow for the horses to get in position behind it and then speeds up to race speed and brings the horses to the starting line already pacing. UNlike TB racing where they start from a dead stop. The Marshal is also used for decorative purposes. I like to color coordinate my mine and Possum's outfits while looking neat and professional. Last year I had a different color for every day and then o nthe last day of racing I wore my show outfit. I like to wear polo wraps, a matching square saddle pad and a mathing shirt, preferably a polo shirt to look neat and conservative breeches and my tall boots. 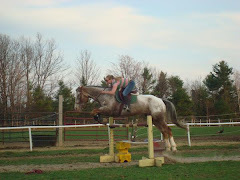 I made so many friends last year and I find it very interestering to learn a new horse sport. It is TOTALLY different from the hunter show world. I like many of the trainers and I get to chat with the drivers too. Lastly the Marshal parades the winner of each race to the winners circle where they get to have their picture taken with the owners and trainer and the family involved. I had such a blast, but it was also a lot of work. Possum also loves this job. He gets to be in front of lots of people and get to do a different job. He never looks twice at the carts and hustle and bustle and goes about his business. Although sometimes we can't help but gallop around the track after parading the horses. It's just our thing that we like to do. Possum will live at the fair for the entire week. I'll get up early every morning and head to the grounds to feed and water and clean his stall. I usually leave for a bit and hang with the dogs and pack my things and come back early afternoon to get ready for the races. Possum really likes staying there was well. He is in the center of everything, gets a nice cushy stall and all the food he can eat. I bring a chair usually and put it in his stall and read or hang with him during the afternoon while waiting to get ready. Ater the races we're both pretty tired. I give him a good rub down, some hay and water and then his dinner after. I'll pick his stall again and hang with him until the fair slows down and then leave to go home around 9ish and do it all over again the next day. This pic is a shot of the races at the Fryeburg Fair, which is a little larger than the Oxford Fair where I will be marshaling, but as you can see, there are a lot of people and it's pretty popular here on the Maine fair circuit. STB race horses can reach top speeds of most horses in a full out gallop. The races are 1 mile long and the track is half a mile. The different kinds of races are pacers and trotters. Pacers are the faster of the two. Sounds like an absolute blast, and a very superior way to spend your vacation! Take lots of pictures, if you can find a spare moment or two! That does sound super fun - do you get paid for doing that or is it purely volunteer work? I loved the fair when i was a kid! So many good memories! Have fun on your vacation - let us know how it goes! That sounds really cool. What a neat way to learn about other disciplines. Possum is just an awesome guy to be so good around all those different situations. What a gem you have! I did love the fair as a kid too. I hope you have a good vacation! I just found your blog and enjoyed your photos from the races. As i read your other blogs, i found that i enjoyed the stories of you working with Possum, even though i dont do hunter/jumper events. Sounds like fun! Hopefully you and Possum will have a great vacation together. Wow that sound sreally fun!! Do you need a helper. Glad your had a good show, and sound slike your other stuff is OK right now, and thats as good a place as any! Actually my Vacation does not start until September 7th, but I'm getting prepared for it now and wishing that it would come sooner. I do not get paid for this job. I volunteered last year and they did not offer to pay. SOme other fairs will pay. Last year was the first year they had a marshal so I jumped right on it before someone else could call it. Thanks for the support everyone. I am looking forward to it. And Jewel, I can always use some help. I won't have my usual groom this year since she is off to college so I need someone to do my hair and carry my water to the track and to talk to. If you feel like coming to Maine let me know hehehe.